TICK is a biannual warm blooded sense space ready for you to burrow your head in, swell, and then a space to lose your head. TICK is an on-line experience art space in the form of a journal open to the world. TICK strives to offer an alternative to the commodification of our perception of art and language. TICK encourages anyone to submit any work which they feel is inspiring, surprising, unclassifiable. Anything that makes the world wobble differently. Anything that goes for blood. Anything from the genera ‘something else’. Anything that can be sent online counts and can be considered. This can include poetry things, video things, image things, scientific anything, theoretical anything, anything art installations, anything that goes, anything that wonders dreams real. Anything that ticks off on. Anything that makes you tick. Your ticks should make the readers twitch. 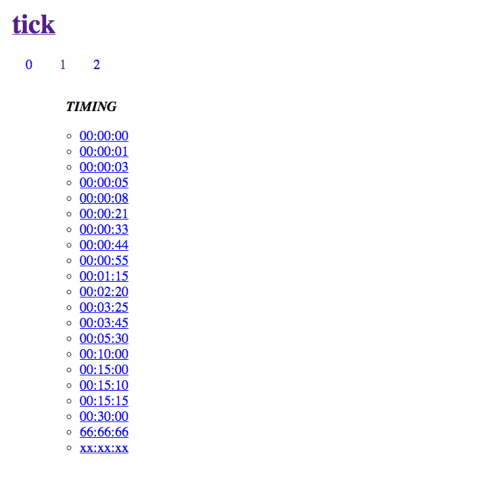 TICK is curated by a rotating group of artists and writers from the Institut für Raumexperimente, Olafur Eliasson Studio, UdK Berlin. Curators of TIMING: Eric Ellingsen, Friederike Horbrügger, Clara Jo, Laura McLardy, Daniel Fernández Pascual, Jorge Miñano Ramírez, Euan Williams.